Crypto Guy In South Africa (CryptoGuyInZA) is Cryptocurrency Enthusiast in South Africa providing Insight & Sharing Own Experience With Industry Leading Digital Currencies Based on Block Generation Technology. I am 34 years old and reside in South Africa, my name is Louis. I work as IT consultant and have been working in IT for over 13 years. I have exposure working with various pieces of software and can adapt as needed. I have a personal passion for Cryptos and taking this journey with the Tron community. 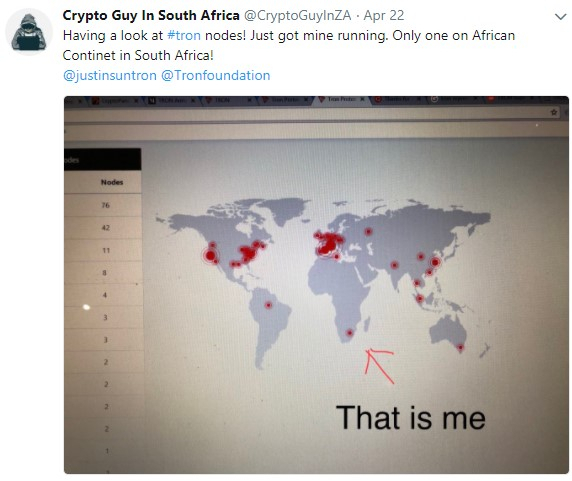 I believe that most people involved in Cryptocurrencies are outside of the African continent and are large companies, I would like to be one of the first real independent ambassador for crypto in Africa and want Tron to be one of those Cryptocurrencies. I strongly believe Cryptocurrencies should be for the people and need independent people like me, I do not believe they should be centralized or be controlled by large companies. I also believe that I have excellent English which will assist to expand the Tron message into English speaking countries. I will start off with AWS hosting for flexibility purposes. I would then like to move to either physical hardware or to a local cloud provider in order to fully show Africa presence. I will start with AWS server and expand as needed. Mainnet nodes to have 2 or 3 nodes. Mainnet additional nodes will be backup nodes ready to take over from primary node or to work in cluster mode. Busy looking at failover options and will implement the best possible option. Mainnet nodes will comply with Tron recommendation of AWS x1.16xlarge. Testnet node is already launched and actively testing with the community. One of the first up and running. Tron will be used to increase hardware capacity for my SR slot. As hardware capacity needs are met then the amounts of Tronix retained will be less and more will be given to the community. Ideally if future Tron explorer shows who votes for my SR I would like to payout Tronix to these voters to the proportion of the Tronix used to vote. I will immediately start sharing with Tron community when in top 27 and creating blocks, Tronix will be shared by launching several initiatives to promote Tron. Within 1-2 month from launch my share percentage will increase drastically to be sharing up to 80% of Tronix (after hardware expenses) with ecosystem in the form of 70%-75% with voters, 5%-10% to donate to development projects within ecosystem. All payments made to Tron voters with balances above a specific % on a regular basis! % to be determined based on transaction expenses at a later stage when mainnet launched. Any Tron remaining will be left in Tron network for future funding. No Tronix will be withdrawn for my own benefit in the first year. YouTube videos – I create YouTube videos illustrating how to do things. These how to videos cover simple things like how to buy Tron, setup SR nodes, develop on Tron, etc. This content will continue over several years as Tron progresses through its development phases. I hope the community will allow me the chance to be in a position to make blocks and support the community through Trons future. Great to see presence from Africa! Like the proposal! You have my vote! Like the proposal, very clear! Great to see someone from Africa running!